It has been a while seen my last post. Lately I have been working on BPMS and Drools. 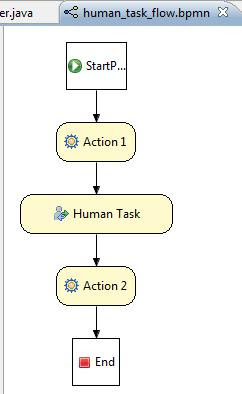 I try to create a simple app using Drools Flow and Human task and now have some small success. While learning and creating my simple app, looking for example online was difficult. Try google "Drools 5.1 Human Task Example" and see what you will get. So I decide to put more example online for reference. It may not be as complete but I'll show the parts that is working. What I try to do is like this.